I don't consider myself fussy about food, but I have yet to meet a boxed granola I like. Boxed brands just don't tend to have the same flavor and lovely chunks as the homemade variety. But the good news is, it’s ridiculously easy to make granola. Like, 5 minutes of dumping ingredients into a bowl easy. Given that it’s maple syrup season I wanted to share an this awesome granola recipe I developed a while back. I pretty much make this every Sunday and over the holidays I made a quadruple (yes, quadruple) batch to gift for family. It was a huge hit! 1. Position rack in center of oven and preheat to 325 degrees. 2. Mix oats, sunflower seeds, nuts, flax, and coconut in a bowl. Add maple syrup and oil and mix well. 3. Spread granola evenly on a jelly roll pan (I always use a Silpat mat to prevent sticking and for easier cleanup). Bake 25 minutes then stir to flip all the granola over. Continue to bake 15-20 minutes. Enjoy! 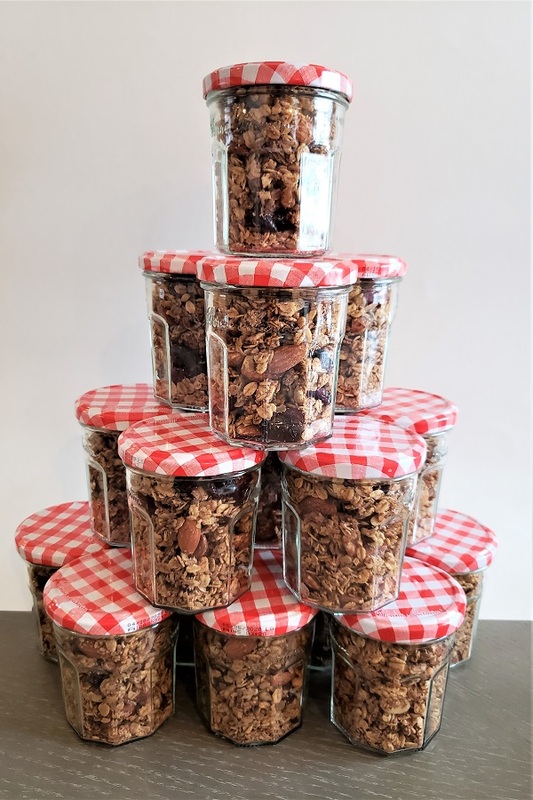 Over the holidays, I recycled jam jars to package this awesome granola for gifts!